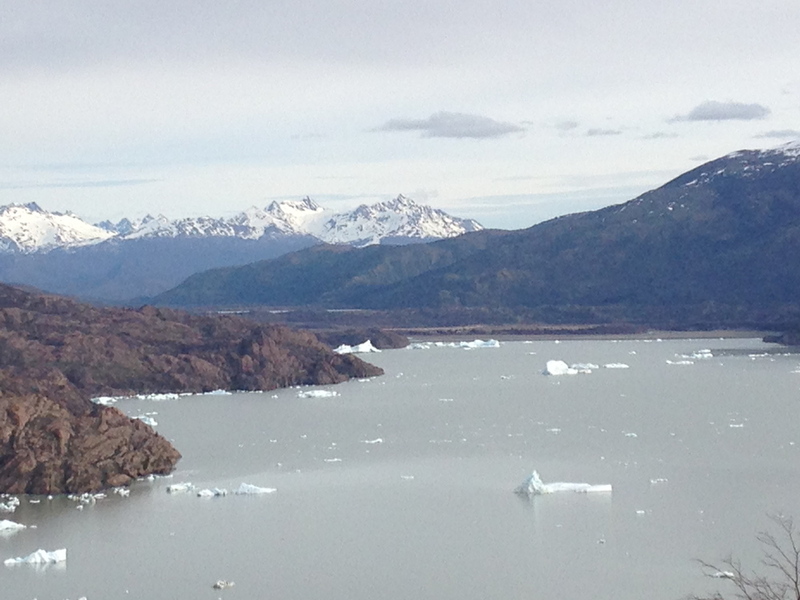 Going light on the Torres del Paine "W"
Ridiculous. This is silly. I am on display for the world to see and I know I don't look a thing like anyone around me. For starters I'm only 9 inches tall, okay maybe 7. My hair grows in only on the very tippy top of my head and is bright yellow. It goes well with my red fur and people say it brings out my eyes. I have a large smile and am always ready with open arms. Of course she is going to take me with her... I'm freaking adorable. She's got me tucked into the back pocket of her backpack staring down the world. I'm here so she knows she's not alone. And, I've got her back just in case someone gets any ideas. My thought, if they see the silly Murray hanging out, smiling, why would someone even think to give her grief? The bonus for me is I've got a great view taking in her opposite vista and enjoying the protection of the shield she provides from the wind. Sometimes it gets a little crammed back here with all of the water bottles, jackets and gloves. In the morning I have this pocket to myself, but by afternoon when the sun starts to warm the earth and her skin, the clothing layers peel away and are subsequently stuffed into my space. It works though. Heck, I have no room to complain, I've got a free ride on the "W". The morning we leave she leaves the bigger backpack at the hotel and loads me along with everything else she will need for a couple of days hiking into her Titan Ultraspire pack, which isn't much. The blue of the pack is another great compliment to my coloring and I know the photos will look amazing. Little did I know that the scenery we were about to witness would take my breath away. I quickly realized my coloring had nothing to do with the amazing appearance of the memories captured with that little phone device. I've heard her talk about her adventures on trails and I've peaked over her shoulder at a few photos, but I had no idea what power resided in those two legs. I am not talking physical power. I am talking about knowledge being power. When you know you can move like that, that no matter what, those pistons and engine can carry you where ever you want to go... that is a kind of power few know and those that do, cherish. I can just tell. The trails we covered the terrain we passed over, the many hours to go various distances, the time out all day long... it was a kind of power that is enabling. It is not something that these ultrarunner people take for granted, it is something they develop, train and utilize to empower them through life. They are not dependent on vehicles or the pocket on someones backpack to get them from here to there. To explore the world under your own power... strong, powerful, willful. Amazing. Lucky. No one was in a rush to get out the door on Sunday morning. I think I heard something about post-race sore legs and hungry bellies as the morning hours ticked by and plans formulated on the route we would pass, how many days we would be out and where we might stay along the way. I was ready. I sat strapped into the back of her "mochila pequena" and smiled. This was going to be awesome. With this group I would have thought we would race out the door once we finally got going, but they continued the casual pace of the morning walking up the trail familiar to how they'd moseyed around the hotel lobby. Those little phone/camera thingys flying out at every turn, preceded by gasping and ahhing and "did you see that?" I envied the bigger backpacks I noticed on the other hikers as we moved past them, I thought - Imagine how comfy I would be in there! And " I bet there are a lot more yummy things to eat and a comfier sleeping bag to share. But alas, you trade comfort for mobility and speed it seemed and even though everyone was walking the two smallest backpacks quickly walked away from the rest of the group. I bounced along and waved goodbye. It was a long way to go that first day, and my legs started to feel a bit cramped all balled up in the pack, but I didn't say a thing. There is NO way I could have kept up with these two. The way the landscape unfolded before us was completely unexpected for all of us. It seemed the consensus that we had no idea terrain could be this beautiful every step of the way. I know she has seen many beautiful places in the world, but I heard her say multiple times that this is the most beautiful place ever. How wonderful that I got to share it with her! She reveled in the fact that the only access was "por pie" by foot. Everyone that we met on the trail had to arrive by foot and therefore could only get to these remote and beautiful places under their own power. Because of this there seemed to be a sense of unity. It didn't matter the language, everyone made an attempt to communicate because we were all in the same place under the same power. Some of my favorite vistas were on that first day of hiking. The lakes meeting the mountains, the rocky beach just past the Refugio Cuerros, hiking back up into the French valley to top off the day were some of the highlights of that first full day of magnificent views. Those two hardly shut up the entire hike, but their conversations were constantly interrupted by the beauty that surrounded us. "Can you believe this?" "Wait, did you see that?" It never failed that they would pick back up sharing stories, pondering issues, recounting race stories and like only good friends can do - continued to get to know each other better while enjoying the new discovery of the Chilean trails. That first night found us camping at the Italian camp in the middle of the "W" with the group we'd started with that morning. Thanks to the two lively CU grads the entire group enjoyed the added comfort of heated water to compliment their dinner and breakfast the following morning. The excellent hosts provided a cozy evening on "the beach" (the sandy spot with an awesome view, just outside of camp) filled with more conversation, views of the grand mountains and the serenades of the avalanches. Talk about power!! What first resembled thunder resulted in the view of snow cascading like a waterfall off the nearby slopes, but far enough away that the view was enjoyed rather than feared. Sleep did not come easily. I believe the three of us spent most of the night trying to get comfortable and stay warm. Going light has its advantages and now very apparent disadvantages. In spite of donning every piece of clothing possible both fidgeted and squirmed throughout the night. I was cozy in my little red suit, but didn't get much for sleep while they tossed and turned. Dawn didn't come soon enough, but eventually the process of tucking everything away into those tiny packs, including me, started and the sleepy campers started walking again. A relaxed stop once again at "the beach" to warm them from the inside both in hot beverage and caffeine I could tell it was time to go as the sleepy, quiet campers started buzzing in conversation and even from the back of her back I could sense the energy building in her legs for the miles of trail that lay ahead for that day. A mellow 7.5km to the Paine Grande Lodge. The trail traversed away from the mountains and didn't undulate as much as the previous day so they were able to move a bit quicker when the cameras weren't stopping them along the way. When the lodge came into sight to two rejoiced, literally. They had taken the chance on their packaged meals, eating everything with the assumption that they would be able to find the next source of calories at the lodge. Once confirmed by talking to the camp host they opted to minimize their packs and only carry the few items needed to hike the left arm of the W up to Lago Grey. An out and back with a guaranteed dinner, shower and bed. I think their smiles matched mine in size and appreciation. I could tell the two were a little tired, likely from the poor night sleep. The conversation didn't stopped, but in spite of less weight on their backs the pace slowed a bit. More photo opportunities helped them recover, but we definitely weren't covering ground like before. Perhaps the rough night of sleep was taking a toll, perhaps the race miles were kicking in a bit. It wasn't a problem, moving slowly along the ridge above Lago Grey was a beautiful way to pass the afternoon hours. The refugio near the Grey Glacier was a welcome sight and the two enjoyed a bit more fuel before starting the decent. With only one pack, the two put their few things in the Titan. She carried it up the trail and he carried it back down. With the temperatures dropping my little back pocket was filled with water bottles which made it a bit less comfy. The bottles having a mind of their own and wanting more of the space they bummed and pushed me around. When they started the final descent back to the lodge from Lago de Pato I'd had it. Enough bouncing around, I'm outta here! And without a word to either human I opted to give this walking thing a try and hit the trail. Free! Dirt surrounded me, large plants soared above me. The breeze rippled through my yellow wispy hair and red fur. Quite a different perspective down here 7 inches from the ground. I can't see over anything anymore and I instantly craved the views of the snowy mountains and glacier green lakes. And forget about covering any ground when these legs cover inches instead of feet per step. Maybe this wasn't such a great idea. Hmmm. Now what? I didn't have to ponder this question for too long. Before I knew it, a kind man with a large backpack scooped me off the trail and attached me to the side strap of his large pack. As he continued his quick pace I heard them journey back up the trail to find me, but I was already strapped to the nice man's backpack in route for the Lago Grey lodge again, but this time under the stars. Thankful to be five feet higher I took in the night and the views once again. He moved quite quickly with good rhythm as the dark settled around us. I dozed off wondering if I would ever see her again. Through the amazing communication of walkie talkies I was passed on to a couple descending the route the following morning, dropped at Paine Grande that afternoon and passed on to some friends of hers. Before I knew it I was handed over and we were reunited again. This time on a bus, leaving the spectacular mountains. What a journey! I think our smiles matched in size once we were together again. I could see her excitement about their last two days hiking. First they made the journey back along the bottom of the "W" and enjoyed a super comfy night at Hotel de los Torres. To finish up the right arm of the "W" they opted rise early, go light and run/hike up to the base of the Torres (towers). Apparently this was the best finish for the W hike with the views, varied terrain, and inspiring aspect from the base of the towers. A spectacular morning and they had the place mostly to themselves. She promised that we would come back and bring friends that want to experience the power of this magnificent place. A few more travel days passed in the towns of Puerto Natales and Punto Arenas before started the long journey back to Boulder. With the love and passion she has for travel I have no doubt that this is only the beginning of many more adventures for me and further continuation of exploring the world for her. As far as I'm concerned, I don't care how ridiculous I look, I'm game to ride along in the backpack where ever this chick wants to take me.